Here's the last page of visibility rules for the shooting chapter. 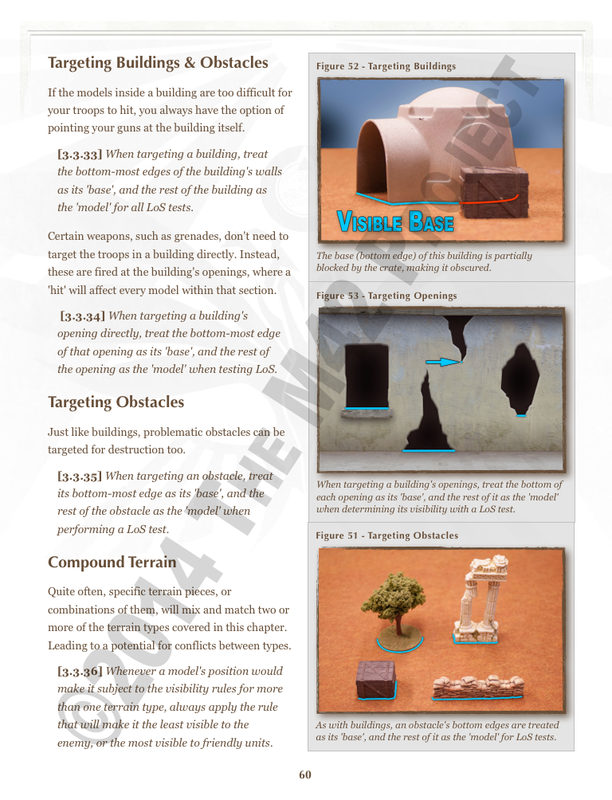 Which covers buildings and openings (rather than the troops inside) as targets, as well as obstacles and mixed terrain. This last week has been so busy it's crazy. I literally had to take one family member to the hospital at 7am last Tuesday, and another to the same hospital just as the first was walking out at 11am. We weren't done until 7pm. Then came all of the follow-up appointments and care arrangements. My 'week off' from the kids was anything but relaxing. I carved out a couple of quiet hours this morning to finish this page, but all of the paperwork that I was going to get to last week is still there waiting. So I'm gonna have to dive right this week and get it done before the next wave of problems hits. It's almost comedic at this point.